- Input impedance: 10 kOhm approx. (Note) When using the interference prevention function, set the emission frequencies for the amplifiers to be covered by the interference prevention function to different frequency values. (Note) The voltage withstandability and the insulation resistance values given in the above table are for the amplifier only. (Note) Connector attached cable CN-14A-C2 is not attached to the models that have no ''-CC2'' at the end of the model Nos.Make sure to use the optional connector attached cable CN-14A(-R)-Cx or the connector CN-14A, or a connector manufactured by J.S.T. Mfg., Ltd.(contact: SPHD-001T-P0.5, housing: PAP-04V-S). Cable length Total length up to 100 m 328.084 ft is possible with 0.3 mm2, or more, cable. Weight Net weight: 15 g approx. Gross weight: 35 g approx. 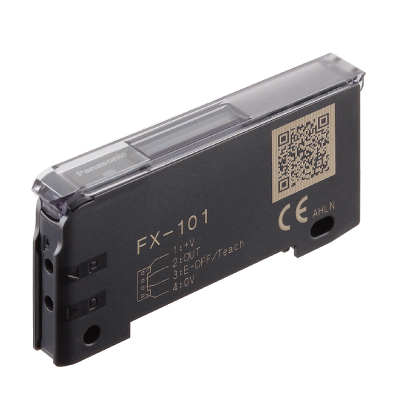 Accessory FC-FX-1(Protection cover): 1 pc. (Note) Protection cover FC-FX-1 has been attached from the production at July, 2011.